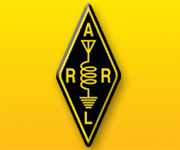 Download and install the latest versions of the MicroDEM and HFTA programs (the only source I can find for HFTA is the CDROM which comes with the ARRL Antenna Book). Determine the GPS coordinates of the planned location of the tower/antennas (this can be most easily done with a GPS receiver or Google Maps). Use MicroDEM to generate a set of profiles (.pro) files for the tower location. Generally these are done every 5 degrees for a full 360 degrees around the tower site. Get the elevation statistics files for 7 regions of the world (US, Europe, Africa, South America, Oceania, Asia and Japan) for the closest metropolitan area to you (in my case this was Boston, MA USA). The HFTA .pdf file explains all of these steps in detail. With this information and files in hand, you are ready to perform the HFTA analysis. Here’s what the merged DEM file for our location looks like. The circles represent mile distances from our tower site. In this post, we will look at the HFTA analysis for our antenna system for one azimuth angle (65 degrees) from our QTH toward Europe. We merged a total of 6 individual DEMs to create the seamless merged DEM shown in the figure (see the HFTA .pdf file for the details on how to do this). The first information that HFTA can produce is a graph of the terrain profile in a selected direction. Here’s what this data looks like for our site towards Europe at 65 degrees. The two diamonds on the graph show the elevation of the two DB36 Yagis at 105′ and 65′. The terrain is conducive to good propagation in this direction from our site and our experience with our existing antennas supports this conclusion. Next, lets look at the performance that HFTA predicts towards Europe for our planned system on 40m. Both antennas out-of-phase (the Red trace). Note the ‘*’ on the antenna at 65′ which indicates it is modeled as 180 degrees out of phase with the antenna at 105′). The elevation statistics used for the run were for Boston towards Europe (the W1-MA-EU.PRN file). The gain of each antenna at a given Takeoff (T/O) Angle is shown on the left vertical scale. You can see that a peak gain of about 15 dBi occurs with the in-phase combination at an arrival angle of about 20 degrees. Note that this tracks well with the EZNEC analysis over flat ground in the previous post. The increase in gain here is partially due to the enhanced “ground gain” developed because the actual terrain slopes away from the antenna. The Purple bars at the bottom of the graph show the probability that a station in Europe will arrive at a given T/O angle. You can read the actual probability for a given T/O angle bar on the right vertical scale as a percentage. Note that this part of the data is based upon predictions and actual measurements over a range of sunspot levels across the entire 13 year sunspot cycle. Note that this does not mean that the band will always be open; rather the bars indicate the probability that a station from Europe will arrive on a given angle if the band is open. Note that the single most important arrival angle is at 1 degree which accounts for almost 8% of all contacts. This is common and speaks to the importance of engineering an antenna system which performs well at low T/O angles. Also note that our planned system does a reasonably good job of covering all T/O angles from Europe in this direction. Thus, we can expect to work station on 40m from Europe any time that the 40m band is open. Now lets look at the performance of our planned system on 20m. First, note how the in-phase configuration of the array (Blue trace) does not do a good job of covering some important takeoff angles above 20 degrees. This is indicated by the “dip” or “null” in the Blue trace. Fortunately, the Stack Match system we are using with the array can also operate the two antennas 180 degrees out of phase (BOP). The Red trace shows how the array will perform in BOP mode. As you can see, the BOP configuration fills in the null nicely and the resulting BIP/BOP combination has 10 dBi or more of gain at almost all T/O angles (except for 1 degrees where we have 7 dBi). The ability to change the pattern (in this case to higher T/O angles) is the main reason for selecting a Stack Match system which supports BIP and BOP operation. Finally, lets see what happens on 6m. The first thing to note is that it is practically impossible to build a Stack Match system which can create a phased array on all of the HF bands and 6m. The ability to match the antennas in this configuration over such a wide frequency range is not achievable at high power with available components. As a result, most HF Stack Match systems (including the one we are using) will create an array of antennas on 160m – 10m and will allow either antenna in the stack to be used individually on 6m. This is the mode of operation that we will look at on 6m. As you can see, the combination of the individual upper and lower DB36 antennas do a pretty good job of covering most T/O angles from Europe on 6m. Except for 15 – 17 degrees, we have 10 dBi or more of gain from one of the two antennas. This leaves only about 5% of the angles covered with 5-10 dBi of gain. The net of all of this is that we should do a good job of working stations in Europe on 6m when the band is open. We did this analysis for all 7 regions, on all HF bands (including the WARC bands) and 6m, trying different antenna heights and separations. After all of this analysis, we settled on placing the two DB36 antennas at 105′ and 65′. This combination along with the BIP/BOP and individual antenna selection capabilities allow us to cover almost all T/O angles of importance to major parts of the world throughout the sunspot cycle. In almost all cases, we can work nearly all stations on a given band if its open. Obviously, all of this analysis consumed a considerable amount of time but I feel the work was well worth it. The resulting “book” of EZNEC and HFTA information has been printed and should make a useful operating aide for our Station once our new antenna system is completed and operational. Now that we know the target heights of our tower and antennas, we can complete the mechanical layout and wind loading analysis for our tower. We will cover these steps in our next post.